Fostering a love of reading is always high on a schools agenda. Bespoke, inspiring and engaging book themed Wall Art can help raise the profile of reading in your school. Studies show that reading for pleasure has a huge impact on pupil’s learning and achievement. The most obvious benefit of children reading regularly is an increased chance of them performing well in comprehension assessments, however, that is not the only benefit of promoting a love of reading. Children who ready daily for enjoyment achieve more than just better test results. Strong reading skills increases a pupil’s ability to access all subjects and learning opportunities. Those who read widely also broaden their vocabulary, which they can then apply across all their learning. Whether they are reading non-fiction books and increasing their general knowledge, exploring imaginary worlds or engrossed in novels set in realistic settings, pupils are being exposed to more learning than one lesson can hold. Reading for pleasure encourages imagination, which will reflect in pupils writing, creativity, ideas and their ability to question the world around them. This in turn deepens their thinking skills and their ability to question and be philosophical. Instilling a life long passion for reading at a young age impacts a pupil’s whole development, not just the academic. Pupil’s who read a wide range of books for pleasure also develop their core values and their understanding of the world and people around them. Reading transports them to times, places, cultures, lifestyles and experiences they would not necessarily meet in their everyday lives. Whether real or imaginary these characters and worlds give them a deeper understanding of communities near and far and of a wider range of other people. From reading books pupil’s can learn life lessons, values, morals, tolerance, mutual respect, acceptance, understanding and empathy. Therefore, reading widely can develop a pupil’s emotional intelligence, social skills and an appreciation of other cultures and lives. The value of reading for pleasure is well documented and advocated, however, it is not always that easy to get children to read full stop, let alone love to read. How do schools go about achieving this? Teaching a creative curriculum using books as a vehicle is an excellent way to foster a love for reading. Planning around a book provides an engaging context to English lessons and can provide plentiful cross-curricular links with a meaningful thread. At the same time a book as a context exposes pupils to rich and diverse learning opportunities that make more sense to the pupils because of the focus book. Schools who use books strongly in their planning are also demonstrating a love of reading that will help pupils develop this value. daily reading slots and more. All of these are hugely beneficial to supporting a schools drive to increase children’s reading but they can also take a lot of time and resources. 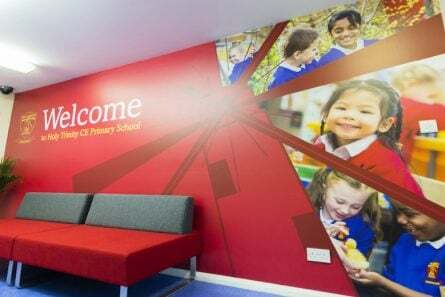 Many schools however overlook a simple, impactful and effective way of inspiring readers – their school walls. Bespoke Wall Art with inspirational quotes, exciting book covers that will help children choose their next reading adventure or parts of stories, settings and characters to fuel their imaginations can provide meaningful learning opportunities and a constant a remainder of the joy that reading can bring. Reading themed Wall Art has longevity and is a constant reminder of the importance you as a school place on reading. 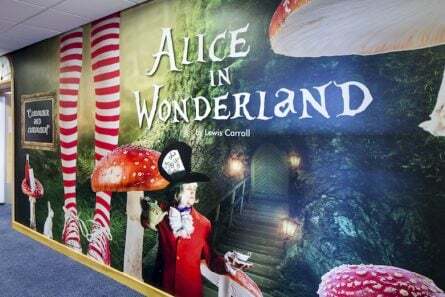 Whether you want to brighten some redundant corridor wall space or transform your school library into an exciting, literature rich environment then we can help you. 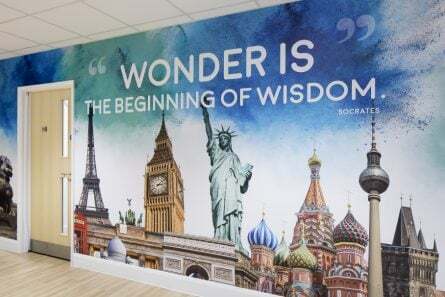 If you would like to use your school walls to promote reading in your school then contact Lisa Savage via lisa.savage@promoteyourschool.co.uk or call 020 7404 3400 now to book a meeting and discuss how we can transform your walls for you.